August 19th of is the formalized annual date of Polygamy Day ®. Supporters of unrelated consenting adult polygamy (UCAP) have been celebrating this date every year since it first began in 2001. 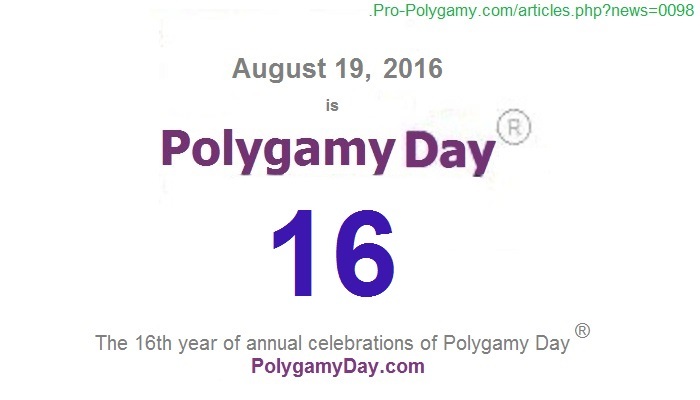 Because that first celebration happened during the "Year 1" of the new millennium, each subsequent "Polygamy Day" has been labelled numerically up to the current "Polygamy Day 16" of August 19, 2016. The original celebration began in Old Orchard Beach, Maine, organized as a get-together for pro-polygamy activists – none of whom were religiously connected to Mormon polygamy or Muslim polygamy. That annual celebration transformed beyond that one event and group into a religiously-neutral event, nationwide, for all forms of unrelated consenting adult pro-polygamists in their own individual geographies. Polygamy Day ® is promoted by Polygamy Day, Inc. The corporation was formed in 2002 in the State of Maine. Polygamy Day, Inc. filed for the federal trademark on "Polygamy Day 6." Unexpectedly, the U.S. Patent and Trademark Office formally trademarked, Polygamy Day ®, on June 26, 2007 - four years after the Lawrence v. Texas and eight years before the Obergefell v. Hodges Supreme Court Decisions. Polygamy Rights supporters celebrate each August 19th to contemplate the legal and political and progress over the preceding year. New or ongoing strategies for the upcoming year of activism are also set and organized.